Get the party started with this incredible homemade olive dip. Olive lovers rejoice! Now you can enjoy both flavors of the delicate taste of black olives along with the salty, tangy bite of a green olives mixed together as one delectable dip. Creamy rich cream cheese and butter blended with with the savory saltiness of the olives makes for the perfect appetizer spread! Delicious served with crackers, breads, crostini and vegetables. Drain 1 jar green olives into a bowl. 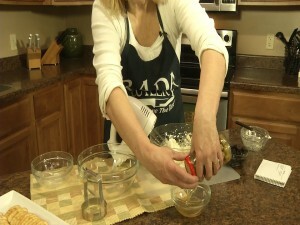 Reserve 2 tablespoons of the green olive juice to add to the olive dip. 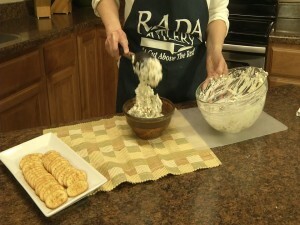 Place 8 ounce softened cream cheese and 1 stick of margarine or butter in a bowl. Add the 2 tablespoons reserved green olive juice. In a bowl, place the drained jar of green olives. Chop the green olives. 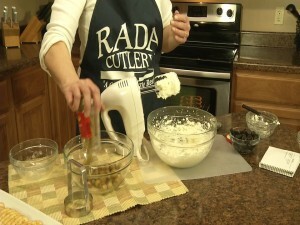 We used the Rada Food Chopper to easily chop our olives. Add 2 small cans of sliced black olives to the green olives and continue to chop. 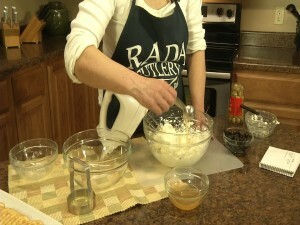 Combine the olives with the cream cheese and mix until blended. 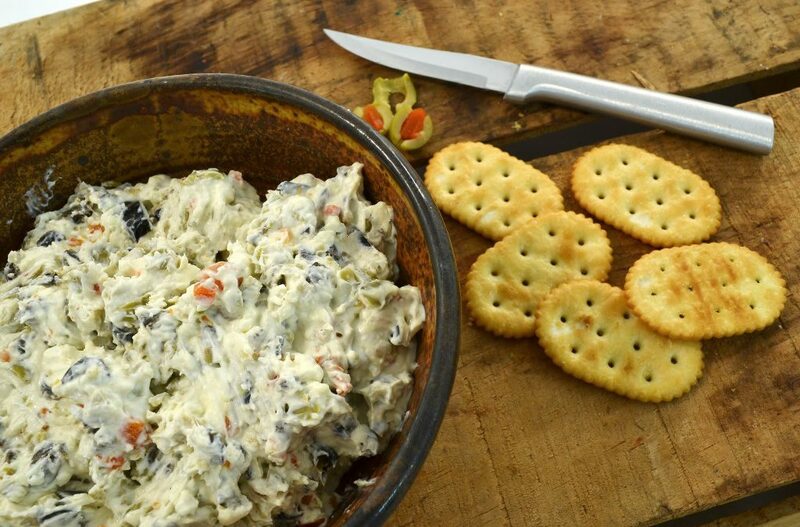 This delicious Olive Dip recipe is delicious spread on bread, crackers, or crostini! It’s sure to be a hit at your next get-together! Looking for more olive-inspired dishes? Try our Cheesy Olive Bread recipe! What’s the Difference Between Black and Green Olives? The color of an olive is based on when an olive is picked. 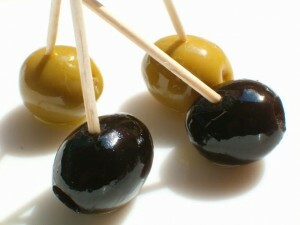 Green olives are picked while unripe, while black olives are harvested when ripe. Green olives are more bitter than black olives because black olives typically contain more oil and less salt than green olives. The olives are then cured in brine. This can take anywhere from a few days to a couple months depending on the method used. The longer the olive ferments in brine, the less bitter the flavor becomes. Now that you know the generally differences between black and green olives, it’s time to start exploring the varieties! From Kalamata to Castelvetrano, there’s bound to be an olive you love. You’ll be amazed by the different flavors you’ll discover among different types of olives. They’re the perfect way to add salty and briny flavors to a dish. Yum! The Best Way to Chop Olives! 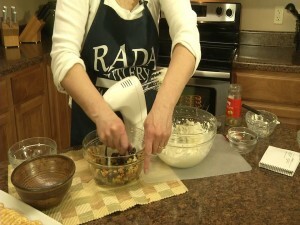 The Rada Plain Food Chopper is the absolute best way to chop olives and countless other foods! 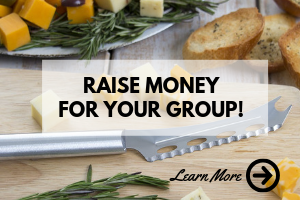 This stainless steel chopper features a sleek, simple design that’s easy to use. 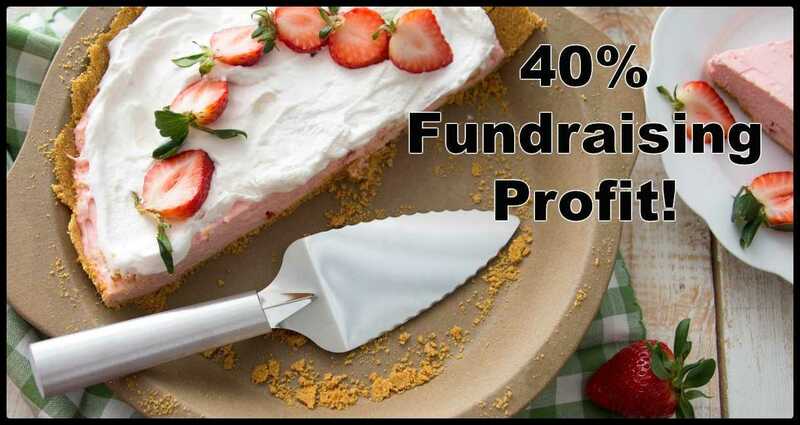 It’s perfect for chopping fruits, vegetables, meats, for cutting cookies or biscuits, and more. 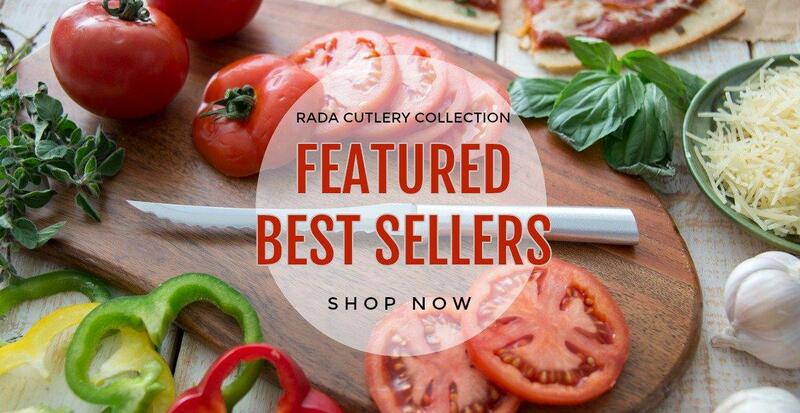 The Plain Food Chopper, like all Rada products, is made in the USA, and comes with a Lifetime Guarantee. 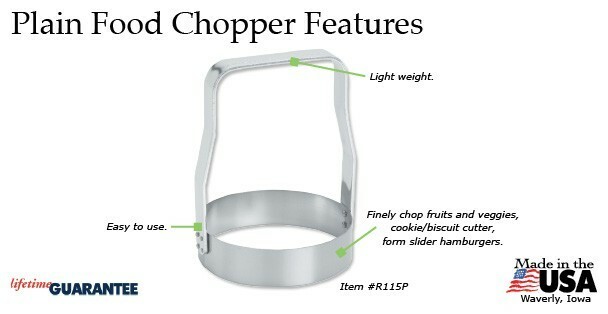 The Rada Kitchen Store has the Plain Food Chopper ready for home delivery! 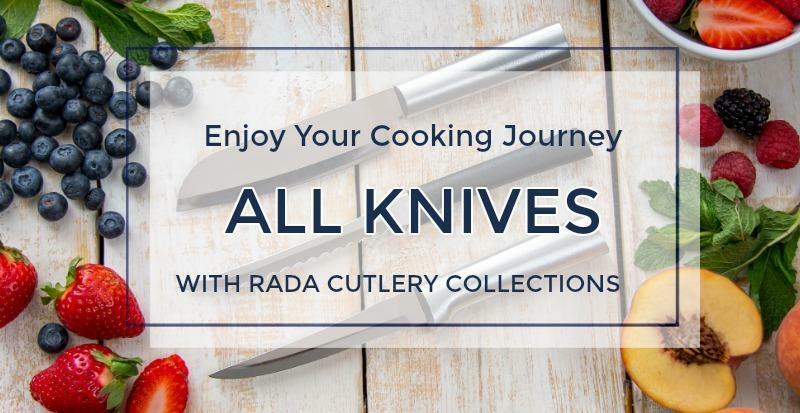 Add Rada Cutlery to Your Kitchen! 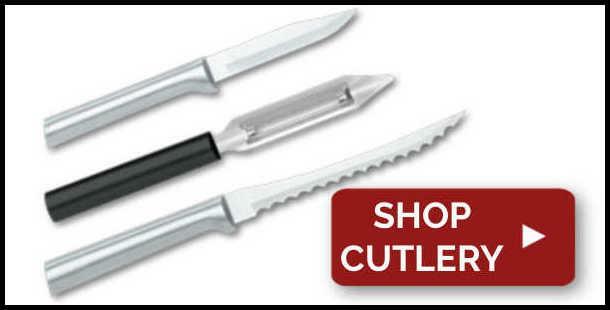 Shop knives, utensils, and quick mixes. 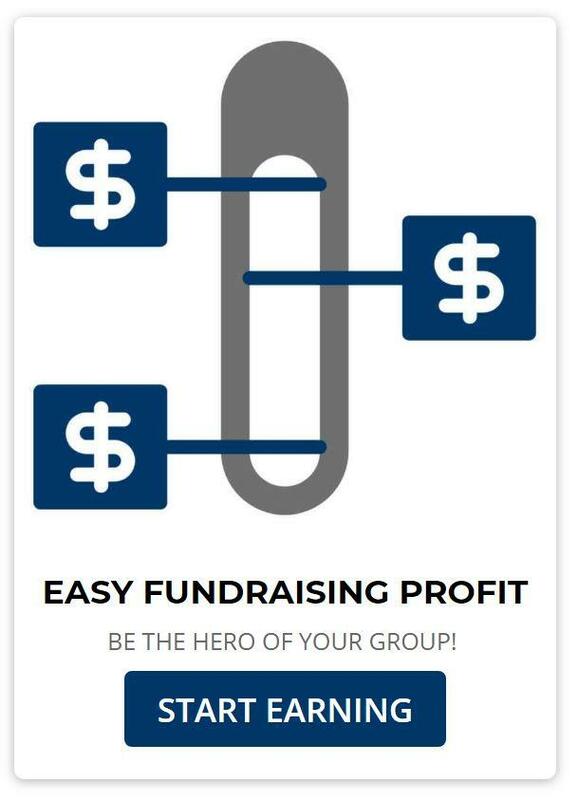 Learn more about earning 40% fundraising profit for your group. 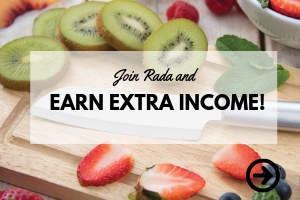 Get in the Rada Business! 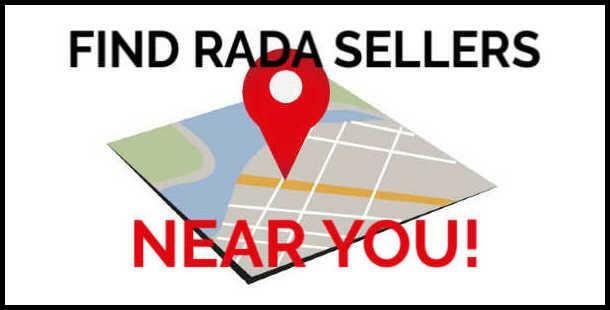 Learn more about selling Rada products! 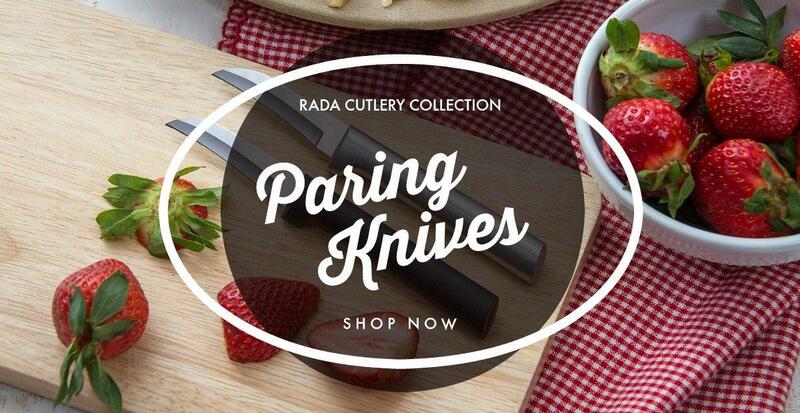 Hi, welcome to the Rada Cutlery kitchen. 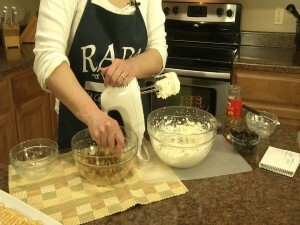 My name is Kristy and I want to share a recipe that uses cream cheese. This is a recipe out of our 101 Recipes with Cream Cheese cookbook. This is an olive dip. Great on crackers and toast. But first you need an 8 ounce package of softened cream cheese and 1 stick of margarine or butter. You need 2 tablespoons of green olive juice. I’m just going to drain these olives, we will need these olives. I’m going to take a tablespoon and add 2 of those to that. Now mix this together. Now, with that jar of olives, we need those cut up. 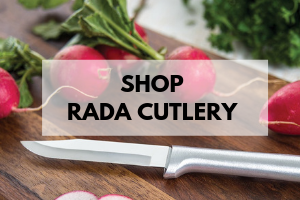 I’m going to take this Rada Food Chopper. It’s a quick way to chop olives, onions, celery, nuts, and hamburger in the pan while it’s cooking. It’s really easy to wash up, there’s not much to it. I use it a lot. Now we’re going to add 2 small cans of sliced black olives. I’m going to put those in with the green ones. I won’t have to chop those as much since they’re already sliced. 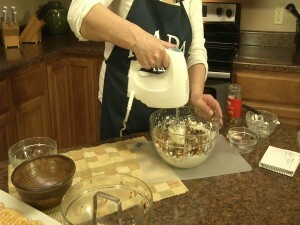 Then I’m going to mix that in our cream cheese mixture. Now we’ll add this to a nice serving bowl. And you probably want to chill it for a little bit before serving. And there you have a delicious, easy olive dip for your crackers. That’s one of the recipes in our 101 Recipes with Cream Cheese cookbook. You didn’t mention the stick of butter? When do you use it? Sorry about the error on our Olive Dip Video Recipe. It’s seems as though our video editor left part of the recipe on the cutting room floor! 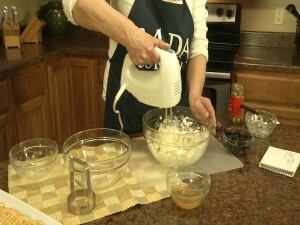 The stick of butter or margarine should be added to the mixing bowl along with the 8 oz. package of cream cheese. We apologize for any inconveniences, and have updated the recipe above. Thanks for watching our videos! You have margarine listed in the ingredients but you don’t show or mention it when you make the dip. Is it supposed to be in the dip?